Based on E.L.Doctorow's best-selling novel, The Book of Daniel, DANIEL depicts the famous trial and story of Paul and Rochelle Isaacson. 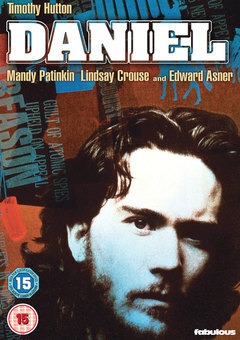 Timothy Hutton as their son Daniel, can’t escape his past, a past that torments him and his sister (Amanda Plummer) with shattering memories of their parents' execution for espionage. Daniel embarks on a painful journey through three historical decades of dissidence and demoralising struggles with the help of his wife (Ellen Barkin), lawyer (Ed Asner) and adoptive parents (John Rubenstein, Maric Tucci).